February | 2013 | Scrap the MAP! We, the Executive Board of the Framingham Teachers Association, stand in support of the Seattle public school teachers who are refusing to give the MAP test for the reason that it harms student learning. Our nation’s obsession with standardized testing is creating schools where students and teachers are having their creativity and love of learning crushed under a blind rush to improve scores. Teachers must take a stand to protect their students’ right to have a learning environment that promotes the development of the all of their talents and capacities not just one that has a narrow focus on improving standardized test scores. The Framingham Teachers Association Executive Board voted this resolution unanimously. Watch live stream video of the event here. WHEREAS: TESTS CONSUME A GREAT DEAL OF TIME AND MONEY. Standardized testing is consuming an ever-growing proportion of education budgets nationwide. WHEREAS: TESTING HURTS STUDENTS. In the name of “raising standards” the growth of high stakes testing has effectively lowered them. As the stakes for tests are raised higher and higher, schools have been forced to spend less time on arts, sciences, social studies, and other valuable content areas, and more time on tested subjects. WHEREAS: RESEARCH DOES NOT SUPPORT USING RESULTS FROM STANDARDIZED TESTS TO EVALUATE TEACHERS. Research shows that nearly 90% of variability in standardized test results is attributable to factors other than the teacher. So-called “value-added” models for teacher evaluation have a large margin of error and are not reliable measures of teacher performance. WHEREAS: The MAP is a major component of teacher evaluation in the Seattle Public Schools, yet the testing company has stated that the test is not designed for that purpose. Furthermore, the margin of error for the test is greater than the required student progress on the test. WHEREAS: Teachers at Garfield High School and other Seattle Public Schools have been told by the Superintendent that they will be suspended for 10 days without pay if they refuse to administer the MAP. RESOLVED: the Frederick County Teachers Association supports the staff at Garfield High School in Seattle and other Seattle Public Schools who voted unanimously to refuse to administer the state’s Measure of Academic Progress (MAP) test. FURTHER RESOLVED: We pledge $100 to the MAP Boycott Solidarity Fund. We are happy to announce that a solidarity fund has been set up. The funds will go directly to participating teachers who will use them to build the campaign and, if it becomes necessary, assist teachers if they receive discipline from Seattle Public Schools. Superintendent Banda has promised “consequences,” Garfield teachers have promised quality education. Winter testing window is extended–Garfield teachers could now face unjust disciplinary measures from the school district, starting Friday, March 1st. What: The Seattle School District attempted to evade the unanimous vote against the MAP test by the organizations representing Garfield High School’s students, parents, and teachers when they forced the school administration to pull students out of class to take the test. For the winter round of MAP testing there were 810 tests originally scheduled. This is NOT the number of students who took the test – keep in mind that some students were to take 1 test and others were scheduled to take 2 tests. At the end of the testing window there were 184 completed tests, 124 in reading and 60 in math. Again, this is not necessarily the number of students who completed tests. There were 104 invalid tests, 69 in reading and 35 in math. This generally means that the students just clicked random buttons on the computer and finished the test too quickly for the results to be considered valid. There were 273 opt out notices. Some of those students who were opted out were scheduled to take 1 test, and some were scheduled to have 2 tests. There were 170 incidences of refusal. This means that a student either refused to come to the computer lab for testing or they refused to take the test once they were at the computer. Some students walked out after logging in, for example. Again, the 170 is the number of tests, not students. Just to be clear, if you examine the numbers and think that they “don’t add up”, it is because some of the numbers deal with number of TESTS but the opt out information is for the numbers of individual STUDENTS. What: While MAP testing is done at Garfield (largely due to the large numbers of students who opted out of the test), according to media sources, the Seattle School District granted a one-week extension for map testing. This means that Friday, March 1st is the new final day of the winter testing window in the Seattle Public Schools. This is now the day that the superintendent could label Garfield teachers–and other teachers from schools boycotting the test–as insubordinate. He verbally told Garfield teachers that he would not suspend them for 10 days without pay, as originally threatened, but teachers haven’t received anything in writing nullifying those egregious charges, as we requested. Superintendent Banda also promised to Garfield teachers in a closed door meeting that, “There will be consequences” given to Garfield teachers. 1) The students, parents, and teacher organizations at Garfield have all voted unanimously against the MAP–the Seattle School District should respect the unanimous voice of the education community they serve. (The teachers’ statement against the MAP is here). 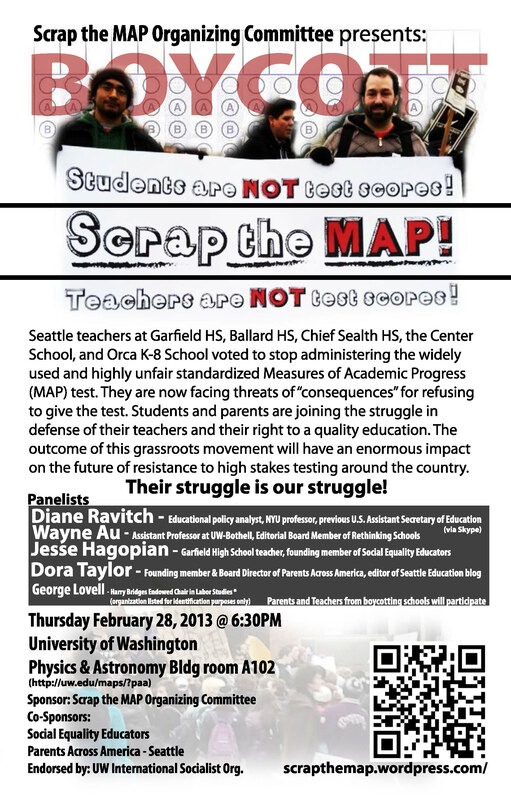 2) When Garfield teachers refused to give the MAP, The Seattle School District pressured the Garfield administration to pull students out of class and make them take the test. That means that the test was administered–although the percentage of students who took the test was minuscule as hundreds of parents opted their students out of the test and hundreds of students refused to take it. Thank you for refusing to administer the MAP test. You are to be applauded for having the courage to take a stand against the fixation on high-stakes testing and its harmful impact on students. The Justice Party of Washington State supports the rights of students to receive a high-quality public education. They deserve it, and this heavy emphasis on repeated testing is not making a contribution to that end. Budget cuts at the state and local level have been going on so long, even the Washington State Supreme Court had to step in to remind legislators of their constitutional obligations. Instead, hard-working teachers have been blamed for the problems of our school system while useless testing has been consuming scarce funds as if more testing offers some sort of universal panacea. Meanwhile, cuts continue to produce a narrowed curriculum that has deprived our students of art, music, gym and other subjects that enrich their minds. We don’t have to tell you that teachers are forced to spend too much time on test preparation and data collection, for a test that is virtually useless as a diagnostic tool, at the expense of actually doing the job they were hired to do. Your actions have opened a national conversation on the impact of high-stakes testing. No one would argue that appropriate assessments are a legitimate part of a high-quality education. But an accountability system obsessed with useless measurements has nothing to do with student advancement. Genuine teaching and learning should drive classroom instruction. We need to be focused on developing creative and analytical thinking, skills which are not easily converted to a paper and pencil standardized test. We are in complete agreement with you on your statement, which reads in part, “…the MAP test is not good for our students, nor is it an appropriate or useful tool in measuring progress…It produces specious results, and wreaks havoc on limited school resources during the weeks the test is administered.” In addition, we are completely opposed to the threats that have been issued against you, and are in solidarity with your courageous action. Originally posted at the Justice Party WA website. No Struggle, No Progress — Should MAP test boycotters be punished or praised? No Struggle, No Progress — Should MAP test boycotters be punished or praised?. Tomorrow, Friday, February 22nd is a big day for the national movement against high stakes standardized testing. That’s when the window for administering the Measures of Academic Progress (MAP) test expires for Seattle public schools. Schools usually have a “window” of dates during which they can administer standardized tests. The window allows administrators to schedule make-up test sessions for students who are absent, for example. Technically speaking, the brave teachers in Seattle who have decided to boycott the MAP test this year have not officially done so until the window for administering the test has closed. Tomorrow, all of those teachers will officially be insubordinate. At that point, the superintendent, José Banda will have to make a decision about whether or not to punish the teachers who have boycotted the test. Banda has an opportunity here to write his name in history next to those of the teachers. If he chooses to honor their integrity and courage, he will be hailed as a hero and visionary by parents, teachers and students nationwide. The original threat that was widely reported in the media — 10 days suspension without pay — was withdrawn verbally, but not in writing. Unfortunately, Banda has maintained the stance that “there will be consequences” for the boycotting teachers. Either way, Friday, February 22nd will be an important date for the national movement against high stakes standardized testing. Not sure what exactly to say? Here are some ideas that were sent to me by a Garfield High School teacher. 1) Teachers who are insubordinate against an unfair test are obedient to educational justice! 2) The students, parents, and teacher organizations at Garfield have all voted unanimously against the MAP—the Seattle School District should respect the unanimous voice of the education community they serve. 3) When Garfield teachers refused to give the MAP, the Seattle School District pressured the Garfield administration to pull students out of class and make them take the test. That means that technically the test was administered — although the percentage of students who took the test was minuscule as hundreds of parents opted their students out of the test and hundreds of students refused to take it.